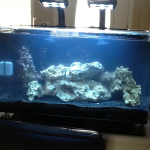 16 gal Nuvo from IM. Stock Skkye lights, spin streams, 15 lbs of LR and black substrate. 6 turbo snails and a fire shrimp and a Xenia coral. Still considering options for other livestock.